The flavours and colours of this soup immediately bring Jamaica to mind. It's substantial enough to be served as a generous lunch or a light supper. 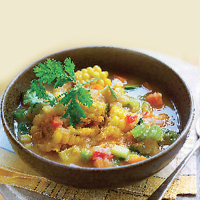 Put the sweetcorn cobs, potato, sweet potato, garlic and creamed coconut in a large saucepan with 1.8 litres water. Bring to the boil, then reduce the heat and simmer for about 40 minutes, until the corn is really tender and the potatoes have started to disintegrate. Use a potato masher to crush the potatoes – this will thicken the soup and give it body. Add the tinned sweetcorn, carrots, courgette, thyme, onion, red and green peppers and allspice berries. Using a knife, pierce the red chilli and add it to the pan. Bring back to the boil, add the ground black pepper and season with salt. Simmer the soup for about 20 minutes until the vegetables are tender. Remove the chilli and discard. Pour in the Reggae Reggae Sauce, sprinkle with the coriander leaves and serve in bowls.